I should mention right off the bat that I haven’t heard any buzz around Don Coscarelli considering a film of “The Book Is Full Of Spiders,” the sequel to “John Dies At The End,” though I hope that he’s at least considering it. Though for better or for worse, it all comes down to money. And speaking of ‘Spiders,’ it reintroduces John and Dave, the (occasionally) intrepid duo from the first film. With David Wong’s first book, which I enjoyed, I was always cognizant that no matter how starnge things got, everything would be alright. 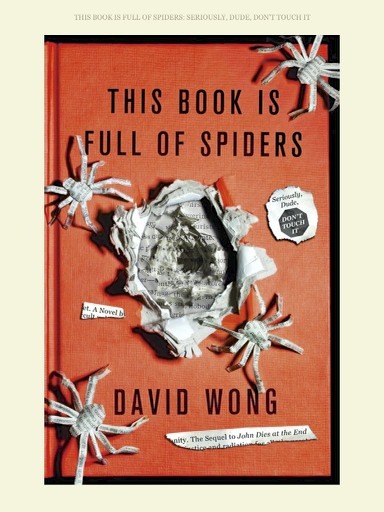 Like the first novel – where John doesn’t die – there are actually no spiders in “This Book Is Full Of Spiders.” That would be too easy. Like in ‘John Dies At The End” they have to deal with is another invasion (of sorts) of our reality, a plot device somewhat similar to that in the first book. Though the invaders are significantly more ambitious than before, and are willing to do what it takes to get ahead. Another difference from the first attempt is that things begin to look pretty bleak for John, Dave, Amy, the town of (Undisclosed) and potentially the entire human race. According to Box Office Mojo “John Dies At The End” earned $141 thousand dollars, which is probably what it cost for catering on a film like “The Transformers,” though one has to keep in mind that it was only released in nineteen theaters. So, while the possiblity that there will be a sequel is slim, those are better odds than none at all. And if it were to happen, the original John (Rob Mayes) and David (Chase Williamson) need to return to the roles that they imbued with such a sense of gusto and humor. And if “John Dies At The End” doesn’t show that Don Coscarelli should be offered Marvel Studios’ upcoming Doctor Strange, I don’t know what does. Posted in actors, Books, directors, Movies.Tagged David Wong, Doctor Strange, Don Coscarelli, john dies at the end, Marvel Studios. SPOILERS AHEAD .What about Molly? Don’t get me wrong, I want this film to be made as much as everyone else if not more. But the Molly (Bark Lee) character is vital to the plot of ” this book is full of spiders”. And as you know, she dies in the film. I’m just wondering how this obstacle would be approached in a new film. Check out the book. It’s a bit darker than the first movie and Bark Lee doesn’t play a role in it–considering that he died in the first, that makes sense. Well, seeing how they butchered the plot of the first book, they’d most likely just leave Molly(bark lee) out of the movie. Maybe they’ll leave out the mysterious box and detective falconer as well. Hopefully they decide to keep john and Dave in the movie. The first novel wasn’t written as a normal book. A screenplay page for page translation was basically three movies. Even the author said he was very happy with the screen version. They can always get another dog. When will Ravager be available? I haven’t been too impressed with some of the Phantasm sequels, so I am looking forward to it.